Navajo Council Delegate Dwight Witherspoon and Election Administration Director Edison Wauneka received the support of the Council’s Naabik’iyati Committee on Feb. 19, 2015, for the Council to fund the presidential elections at $317,891. Wauneka also presented an update on the presidential elections to the Naabik’iyati Committee, which was meeting in the Navajo Council chambers in Window Rock, Ariz., Photo by Marley Shebala. Please provide proper credit when re-using. The Navajo Nation Supreme Court invalidated the Council’s legislation that nullified the 2014 Presidential Primary Election and called for a 2015 Presidential Primary Election with all 17 presidential candidates, including disqualified presidential candidate Chris Deschene, in June and a Presidential General Election in August. The Supreme Court’s decision today, which was issued through a 3:24 p.m. press release, also voided the Council’s pardon of the election board, which the high court had found in contempt of court in October 2014 for ignoring its order to comply with the tribal Office of Hearings and Appeals’ disqualification of Deschene for lying on his presidential candidate’s affidavit and claiming that he spoke the Navajo language fluently. The disqualification of Deschene automatically triggered election law that mandated that Election Administration Director Edison Wauneka immediately remove Deschene’s name from the ballot and place the name of the third runner up on the ballot, which was then Council Delegate Russell Begaye of Shiprock, N.M.
Begaye’s running mate is Council Delegate Jonathan Nez, who represents the communities of Tsah Bii Kin, Navajo Mountain, Shonto, and Oljato. In a press releasae today, Begaye staated, “The legal matter that was brought before the Navajo Supreme Court has never happened, nor do I believe that any person would have foreseen the events which have transpired with this particular election. The Election Board, which is Wauneka’s boss, held numerous meetings with tribal Attorney General Harrison Tsosie, Chief Legislative Counsel Levon Henry and legislative attorney Ron Haven about the legality of the OHA disqualification of Deschene and the Supreme Court’s support of OHA, which Wauneka attended. But at no point did the Election Board direct Wauneka to comply with the OHA decision and have the names of Deschene and his running mate, Fannie Atcitt, removed from the 2014 General Election ballot and have ballots reprinted with the names of Russell Begaye and Jonathan Nez. And when the initial election grievance against Deschene was filed by presidential candidates Dale Tsosie and Hank Whitethorne, the Election Board failed to call for a temporary halt on the printing of the 2014 General Election ballot for the presidential race until the grievance and all appeals were resolved. During yesterday’s Naabik’iati Committee, Council Delegate Nelson BeGaye pleaded with delegates to honor their agreement to stand in solidarity with CD-80-14 and CD-81-14, even if the Supreme Court ruled against the Council. CD-80-14 and CD-81-14 were the two pieces of Council legislation invalidated by the Supreme Court today. Begaye made his statement after the Naabik’iyati Committee, which is the Council’s top standing committee, voted 14 in favor, 3 opposed for the Council to appropriate $317,891 for the election administration to conduct the special presidential election. The Supreme Court, in its decision today, ordered the Council to hold a special session to fund the special presidential election between Joe Shirley Jr. and Begaye. The justices also ordered the election administration to hold the special presidential election as soon as possible. At yesterday’s Naabik’iyati Committee, Election Administration Director Wauneka reported to the committee on the special presidential election after Delegate Edmund Yazzie called for an update of the election. Wauneka reported to the committee that if there is no Supreme Court decision that afternoon, then the office is unable to have absentee ballots printed for the 110 reservation chapters. He added that he was hoping to hold the special presidential election on March 24 but that’s not going to happen because of the “lateness” of the Supreme Court decision. If the decision is this week, the special presidential election will be on March 31, Wauneka said. Wauneka reported that Shiprock requested 1,700 absentee ballots and Fort Defiance has requested 4,500 absentee ballots request. Absentee ballot requests are also coming from areas off the Navajo Reservation and so the election office must allow 30 days for absentee voting, he emphasized. Delegate Yazzie responded to Wauneka’s update by saying, “We are still at a point where we say we don’t know. I know there is funding in the election office for him to go on the radio and explain what is going on instead of yelling at people when the asked about the election. He was referring to Wauneka’s failure to comply with the Council’s December 2014 legislation that the Supreme Court ruled out of order today. Yazzie also asked Wauneka to do radio announcements to update the public about the presidential elections. Naabik’iyati Committee Chairperson LoRenzo Bates assured Yazzie that as soon as the Supreme Court issued a decision, he would issue press release via the internet. The Supreme Court also decided not to hold the Council delegates, who voted in favor of Cd-80-14 and CD-81-14 and Wauneka in contempt of court. The Supreme Court of the Navajo Nation has invalidated two Navajo Nation Council resolutions, Resolutions CD-80-14 and CD-81-14, and ordered the Director of the Navajo Election Administration to hold the general election as soon as possible for the Office of the President with candidates Joe Shirley, Jr., and Russell Begaye. The Court also ordered that the NEA hold elections for six vacant positions of the Navajo Board of Election Supervisors in conjunction with the presidential election. The Court further requested the Speaker of the Council to convene a special session and for the Council to quickly address funding of the election. The Court denied the request of the Petitioners to hold Council Delegates and election officials in contempt and/or to remove them from office. Resolution CD-80-14 called for a new primary election for the Office of the President to be held in June 2015 and a special general election to be held in August 2015. The Court stated that election laws are organic and our current system of participatory democracy does not allow changes to those laws without proper consultation with the People. While the Council asserted that the action was a special remedy to an emergency situation, the Court stated that the laws of the Navajo Nation already provide a remedy in the event of a disqualification of a candidate after the primary election is held. The Navajo Election code at 11 N.N.C. § 44 requires that in the event of disqualification, the candidate receiving the next highest votes in the primary election shall be placed as the new candidate on the official ballot in the general election. 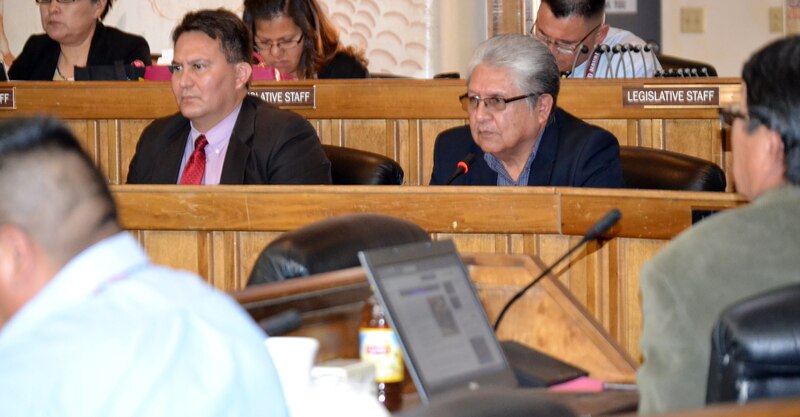 Resolution CD-81-14 pardoned and reinstated the Navajo Board of Election Supervisors who had been found in indirect civil contempt and removed from office. The Court noted that there is no statutory provision for the power to pardon in the Navajo Nation Code and that in 1995, then attorney general and then chief legislative counsel cautioned the Council on pardoning an individual. The Council was advised to establish a law to give it the power to pardon but has not done so since then. While the Brief of the Navajo Nation Council argued that forgiveness is a core Navajo value, the Court stated that to restore harmony, the offender must own up to his or her actions, offer an apology and rebuild relationships. The Court found no record that the former Board members had offered such an expression. In this opinion, the Navajo Nation Supreme Court reiterated that all powers not delegated are reserved to the Navajo People. The Court cited case law which stated this right cannot be denied or disparaged except by vote of the People and that amendments to the Navajo Nation Code must be done in a manner that does not disturb or undermine the principles of check and balances, separation of powers, accountability to the People, acknowledgement of the People as the source of Navajo Nation governmental authority and service of the anti-corruption principle. The full opinion for Tsosie and Whitethorne v. Navajo Board of Election Supervisors and Navajo Election Administration, No. SC-CV-68-14, is available on the www.navajocourts.org website. This entry was posted in News Articles, Professional Journal and tagged Chris Deschene, Edison Wauneka, election administration, election board, Navajo, Navajo Nation Council, Navajo Nation Supreme Court, presidential election by Marley Shebala. Bookmark the permalink.